Trauma is the leading cause of death in the United States for persons age 1 through 44 years – specifically 43% of all deaths ages 1 through 4, 48% of all deaths ages 4 through 14 and 62% of all deaths ages 15 through 24. The Trauma Department at United Regional has been tracking trauma patients through our health care system for 20 years. As a result of these efforts, a database known as the Trauma Registry, is filled with information on more than 10,000 injury victims. 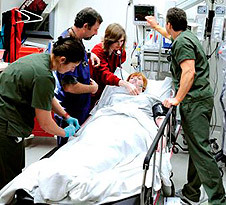 When a patient is hospitalized as a result of traumatic injury, the Trauma Department steps forward to look at many aspects of the situation including circumstance, treatment, cost and outcome. The Trauma Registry is designed to store and report data about patients hospitalized as a result of injury. All information entered in the Trauma Registry is reported monthly to the Texas State Trauma Registry, as required by the Texas Department of Health. State officials are then able to evaluate trauma statistics across the service area. The Trauma Registry is used by our Trauma Committee, and other entities to design Injury Prevention activities. The data also supports quality improvement activities for medical and nursing staff and helps to improve care to patients hospitalized after a traumatic event. The wealth of data available from the trauma registry allows us to study, plan, and implement care of the trauma patients at United Regional.